South Korea’s trade surplus with the United States thinned for the third straight year in 2018 amid surge in oil and gas imports from the United States to avoid trade skirmish with the world’s largest economy. According to the Ministry of Trade, Industry and Energy on Thursday, Korea’s trade surplus with the U.S. contracted 22.9 percent to $13.8 billion in 2018 from a year ago even as bilateral trade increased 10.3 percent to a record high of $131.6 billion. 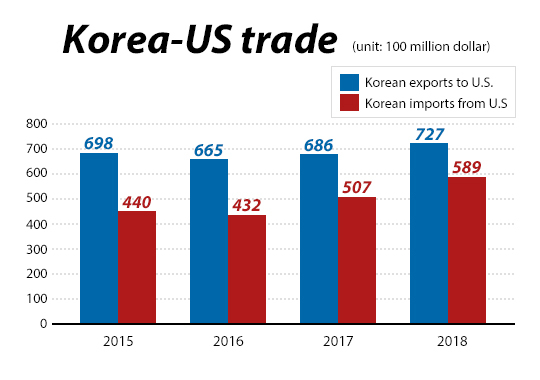 Korean exports to the U.S. amounted $72.7 billion, up 6.0 percent and faster than the country’s overall annual exports gain of 5.4 percent in 2018. Shipment of semiconductors jumped 90.6 percent, machinery up 32.4 percent, petroleum products up 15.7 percent. Meanwhile, auto exports to the U.S. shriveled 6.9 percent against a year earlier period. Exports of mobile devices and rubber products fell 6.2 percent and 2.2 percent, respectively. Korean-made goods accounted for 2.9 percent of the U.S. market in 2018, a level unchanged for the last four years. The nation’s imports from the U.S. gained 16.2 percent on year to $58.9 billion in 2018, largely due to a sharp jump in energy imports to appease the Trump administration that has been resentful of trade deficit with Korea. In 2018, Korean imports of U.S. crude oil soared 520.1 percent against previous year, natural gas 179.2 percent, and liquefied petroleum gas 50.3 percent. The U.S.’s market share in Korean energy market reached 11.0 percent, outstripping Japan to become No.2 seller. The service trade between the two countries rose 7.2 percent on year to $45.2 billion in 2017, the latest comparative data showed. Korea’s service exports in 2017 reached $14.9 billion, slightly up from $14.6 billion in 2016. Service imports from the U.S. expanded 10.3 percent on year to $31.3 billion over the same period. Korea’s service trade deficit with the U.S. grew bigger in 2017 to hit $16.3 billion. The deficit has increased 20.6 percent on average from 2012 to 2017. A revised Korea-U.S. trade agreement went into effect as of Jan. 1 this year after Seoul and Washington made amendments to the original one that took effect in 2012 upon the request of the U.S. administration complaining about the country’s growing trade deficit with Korea.